Stoliczka's Bushchat, Saxicola macrorhyncha, is an Old World flycatcher in the genus Saxicola. 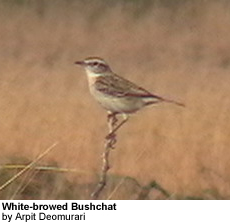 It is also known as the White-browed Bushchat. This desert specialist has a small, declining population because of agricultural intensification and encroachment, which qualifies it as vulnerable. Stolizca's Bushchat is found in a circumscribed area of semi- arid country in north-western India and (perhaps now formerly) eastern Pakistan. It has apparently strayed as far east as the Bharatpur area of Rajasthan and as far south as Goa, with two simultaneous historical records from southern Afghanistan.